Approved by the American Board of Orthodontists for those seeking diplomate status. 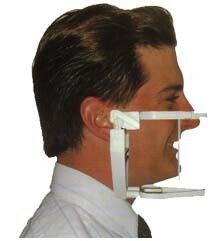 Inexpensive enough to have an individual Simulator™ articulator for each patient. The mounting of casts requires no more time than is needed to prepare hand-held casts to ABO standards, and mounted casts provide better information. Once the Simulator™ Articulator System* is owned, it costs no more to mount casts than it does to prepare hand-held casts to ABO standards. Unlike hand-held casts or traditional articulators, the Simulator™ articulator can display the borders of each patient's treatment goals. Unlike many traditional articulators the view of the teeth from the lingual perspective of the Simulator™ is unobstructed. Reusable - once active treatment is completed, the casts are removed and stored, then the Simulator™ device's body is used for the next patient's active treatment. Interchangeable--casts can be transferred to any other Simulator™ articulator with assurance of accuracy because manufacturing tolerances are within five-thousandths of an inch. The third referent for facebow orientation is the Sharon plane, a transverse plane of the head that passes through the TMJ axis, rather than Frankfort. With this method, the occlusal plane of the casts appear as they do on the patient, not 'dumped' as often occurs when Frankfort is the referent. Relative to the Sharon plane, Frankfort can range 30° among patients. This is important for orthodontists as well as maxillofacial surgeons when mounted casts are used for surgical treatment planning. Mounting plates are easily slipped on and off horizontal posts (no screws). The posts also permit the sliding of the casts forward and back to preview proposed AP jaw corrections (orthopedic or surgical). The Verticalizer™ device is an accessory for the Simulator™ articulator system. It is not essential for routine cast mounting. The device displays the head's estimated frontal plane and provides a level that indicates when the head's frontal plane is vertical. It also provides a vertical referent to which the facebow, which also has a level, can be oriented horizontally. This method allows the position of the dentition to be measured relative to the planes of the head so the casts can be similarly oriented to the planes of the Simulator™ articulator. The Verticalizer™ device also measures the forehead's inclination, provides a table that reveals what the AP goals should be for the teeth and jaws relative to the forehead's prominence and inclination. The operatory Simulator™ articulator is not as rigid as the laboratory Simulator™ articulator. 100% rigidity is not necessary for operatory articulators used by orthodontists or surgeons because their work is performed on the patient. Prosthodontists and gnathologists do their prosthesis work on the articulator and need rigidity. Unlike metal articulators, the Andrews™ Simulator™ articulator is plastic and will not permanently distort if dropped. The TMJ anatomy of each Simulator™ articulator matches average TMJ anatomy when measured from the planes of the head (eminence 35°, lateral 5°). Shelf space will usually accommodate as many Simulator™ articulators as it will mounted casts that are not attached to an articulator. Starter Kit includes mounting station that rotates 360° for better access during mounting, a jig system that reduces the number of facebows that an office would otherwise need, ten Simulator™ articulators, and 20 mounting plates.